My topic is "The F Word: An Atheist's Guide to Addressing Faith"
I'll be writing up the lecture and posting it here shortly. Please come if you're in the area. One of the most frustrating and maddening things about Religionists of all stripes is the way in which our single greatest strength, our inherent ability to understand, our inherent need to know and learn, and our ability to rationally discover truth about the Universe has been inverted and turned into the alleged source of our fallen and debased human nature. Our Original Sin is that we are rational beings who desire to understand. In its place, they foist this Faith in the unknown, unknowable supra-entity as the solution to the problem of our fallen-ness which just so happens to neatly avoid the fact that they have no evidence that would satisfy a rational being's desire for understanding. What about Hume? Is it rational or irrational to say, "I have faith that the future will be similar enough to the past to make predictions on future events."? It is hoping. It is irrational, albeit practically rational. Can that not be faith? I'm really interested in your thoughts. I've always wondered about throwing "faith" into the induction problem. Thanks guys. Hmmm, well, Hume wouldn't accept the faith answer to the problem of induction. And while some people may say that that's how they solve, it's not really a solution. You'll have the same floodgate problem there that I argue you have with religious faith. Sometimes people seem to be suggesting that we all already have faith about things like induction, so it's ok for us to do about just any old thing. But I don't understand that at all. I'm trying to determine if faith is the same thing as the irrational belief that the future will be like the past. They seem to have the same definition, which is hoping or wishful thinking. If so, then where is the logical consistency in saying believing some things on faith (PUN) but not other things (religion)? I think the only way to do that is to show that they are not the same. Or that the PUN is not a faith. But I'm really interested in how one would go about that. (sorry for the extra post). Faith is different than the (arguably irrational) belief that the future will be like the past. Faith is justification-less belief. My belief that the sun will rise tomorrow morning is based on my experience that the sun rose this morning and every other morning of my life. While this is insufficient evidence to guarantee that the sun will rise tomorrow, my expectation/belief is based on the best data available (i.e. I am practically certain that the sun will rise tomorrow but there is no way that I can be definitely certain). Missionary, that's a great link to Law's post. I have people pull the nuclear move on me weekly. The idea seems to be that if it's true that we have faith about some other matter,then it's ok to have faith about anything and everything. Law really nails it here. Thanks. Missionary, Hume's argument that we cannot know that the sun will rise tomorrow isn't that we can't be absolutely, or deductively certain about it. He argues, famously, that the claim that the world will behave in the future the same way it has in the past, particularly regarding causal laws, can't be justified at all. You can't defend it either deductively or inductively. R.M. Hare is one that I know of. His argument seems to be something like, well, we already take many other things, like future inductions, on faith. So it's ok to go ahead and do it about God too. He's wrong on both those counts. 1. If all knowledge is either a matter of fact or a relation between ideas, then we do not have knowledge that the future will resemble the past. 2. All knowledge is either a matter of fact or a relation between ideas. 3. Therefore, we do not have knowledge that the future will resemble the past. 2. But we do have knowledge that the future will resemble the past. 3. Therefore, it is not the case that all knowledge is either a matter of fact or a relation between ideas. That is, if Hume's method produces skepticism about causal laws, then perhaps it's the method that jacked up, not our knowledge of causal laws. This is exactly Kant's answer, G.E. Moore's answer, Carnap's, Quine's, and many others. That's why I was so puzzled and resisted it when you tried to saddle me with the view that I believe in induction as a matter of faith. Just pulled Hume's An Inquiry Concerning Human Understanding and Dialogues Concerning Natural Religion off my unread bookshelf. Plan to start off with Simon Blackburn's How to Read Hume. Hopefully, all of this will disinfect my brain from my current read, Dinesh D'Souza's What's So Great About Christianity? D'Souza "goes nuclear" throughout the book and suggests that Hume's argument actually proves that miracles are possible. Of course, the trick is moving from "possible" to "likely". I just noticed that the late Ken Pulliam ( blogger of "Why I De-Converted from Evangelical Christianity" and Conversations from the Pale Blue Dot interviewee) had this blog listed among those he read every day. That's quite the compliment. Yeah, Ken was a reader and frequent contributor. I didn't know him well, but I was surprised and saddened to hear the news. Basing this comment solely on the presentation file you provided, I found two significant assumptions in your argument that could be very contentious. (1) You take on the epistemic stance that faith fails to provide a basis for truth. (2) You characterize (caricature?) the faithful as trying to exclusively identify "the one true God." The reason (1) is contentious is because epistemology does not necessarily aim for truth, and there are a plethora of other desiderata we can consider. I have in mind here those scientific values that lead us to accept certain theories over others. Rarely does science aim to capture truth. Instead, the epistemic game we're playing is often to devise models that "save the phenomena" we observe, to be simple, coherent, be useful, etc. This is true whether we take an anti-realist stance like van Fraassen's (constructive empiricism) or any number of realist positions, old (positivists) or new (structuralist). So if we abandon the notion that our epistemic models aim to capture truth, which is often the case, then the argument sustained by (1) is obliterated. We have, then, to only ask: do the faithful aim to capture truth? I find that doubtful. The faithful desire things like living a moral life, making their actions coherent with the stories of their canon, or maintaining rituals to honor their beliefs (I speak here of any religion, not just Western or organized). For (1) to be maintained, you need to qualify the severity of truth-seeking by the religious, and that their faithful epistemic mode is, actually, aiming for truth. Furthermore, you would need to qualify the significance of truth as an epistemic standard. Even amongst realists, where it would have the most significant support, I have rarely seen it advocated. (In fact, much that I have read on scientific realism, as I said, advocate other desiderata). The problem with (2) is much more simple. Depending on (1), it is rather straight forward to see that the idea of "one true God" has no significance unless the believer is steadfast on truth-seeking. Here one needs to qualify the extent to which maintaining religious belief and religious epistemic standards demands that they uphold an exclusivist modality with respect to their beliefs. The evidence for this modality is actually the opposite. Here I am thinking of the Pew Forum reports, which their full reports indicate that believers tend to be inclusivist in their modality. So your argument hinges on two very strict renderings of religious belief. The epistemic stricture is that we demand truth, and faith fails this desiderata. As such, religion is epistemically useless. The belief stricture is that to believe in God is to identify the "correct" or "true" God. Since there are an infinity of Gods to choose from, and we lack the epistemic measure to find the "true" path, the believer is lost. Both of these positions fail as soon as you relax those assumptions in the slightest, and to maintain those positions demands great qualifications that I don't think you can maintain (the latter being countered by evidence, the former is philosophically lacking). I offer an example from the philosophy of science. On slide 12 you ask, "how many ... hypotheses are out there for your consideration?" I left out the "supernatural" adjective because this question is maintained over any epistemic position, including science. By the standards you set with (1), even science fails to live up to par, because we do not weed out one hypothesis or theory from another because one is "more true" than another, whatever that would mean. Theory acceptance is a vast topic to which I have alluded in this comment, but it is well argued that it is both a pragmatic, value-laden practice amongst the scientific community, imbued with recognition of certain virtues, the least of which includes truth, if at all. So your argument hinges on two very strict renderings of religious belief. The epistemic stricture is that we demand truth, and faith fails this desiderata. As such, religious is epistemically useless. The belief stricture is that to believe in God is to identify the "correct" or "true" God. Since there are an infinity of Gods to choose from, and we lack the epistemic measure to find the "true" path, the believer is lost. I wanted to add, if you would like me to substantiate my claims regarding theory acceptance, I can post a number of references later. I'm just killing time, and am too lazy now. It's 2 in the morning after all! Thanks for the input Brian. Lots of interesting ideas here. Here's the short answer: there are literally tens of millions of people who are taking the view that I am criticizing here that, 1. their faith allows them to apprehend the truth that God is real, and 2) there is one true God, the Christian God, who their faith gives them access to. In order to sustain the sorts of criticisms you're bringing up, one would have to abandon the position I'm objecting to. Faith as it is practiced in the vast majority of cases I've seen presumes a simple minded brand of correspondence theory about truth that suffers from the anti-realist objections you're bringing up. That's not my mistake, it's theirs. So you and I are in agreement about a lot of this. Furthermore, if someone claims to have faith in God, but he lays aside all claim to "God exists is true" through that faith, then I see what they are saying as either incoherent or irrelevant. If their faith is solely a matter of comfort, usefulness, or emotional fulfillment, then I have different objections. The problem, of course, is that the faithful rarely or never make this separation as carefully as you are. What starts with an emotional or pragmatic justification slips over to talk about what is true. Part of the problem is that you can't really work out a coherent account of belief that doesn't build in truth. If believing p doesn't include thinking that p is true, I don't know what belief is at all. Some of your points about anti-realism are correct. But even if we accept the Van Fraassen style argument that the acceptance of a whole theory ultimately rests upon a wide range of values and utility, no one thinks that that puts a faith model of the world and the scientific model of the world on the same par. With regard to the "eliminating all of the alternative hypotheses" point, science has the crucial virtue that faith lacks. In science we actively seek out disconfirming evidence and corroborate theories on its basis. With faith, there is no means for judging between competing or conflicting world models. Personal prejudice becomes the only measure of model acceptability. The other difference between anti-realist and faith models of reality is that the former rejects "it gives me the warm fuzzies" as a criteria for model acceptability. Big topic and lots of interesting stuff here. Thanks for your thoughtful input, Bryan. Lots of interesting ideas here. If I can summarize, your objections seem to be that my attacks on faith are weak because they make mistaken non-anti realist presumptions about truth and scientific theories. The assumptions in question: 1. Faith provides a basis for truth, and 2. faith gives us access to the one true God. But these aren't my assumptions to defend. There are literally tens of millions of faithful believers who have these views. I'm objecting to their position. If anti-realism further undermines their argument, then so much the better. I have another response on my other computer that will elaborate if I can navigate around some technological problems I'm having. The short answer is that if adopt anti-realism, and I agree that we should, then faith really goes down in flames. In it, they break down the interpretation of scripture, which I think makes for a good representation if this issue. If you compare the proportion of each of the affiliates and the extent to which "literal word of God" is weighed against the composite alternatives, the fact is that the majority of religious people do not seem to accept the sort of "one true God" interpretation of their religious beliefs, as presented by their holy scripture. So when you talk about the "vast majority" you are simply wrong. There is no evidence for this vast majority, and statistics like these (though, being a statistician, I have complaints) suggest exactly the opposite conclusion. But to return to the metaphysical issue, you are right to point out there are stark differences between faith and science. My critique was not to say they are in any significant way homogeneous with each other. The point was that on the front you present, they are on the same footing. Where they differ, as you point out, is in their methodology. But methodological merits of science are another matter from the metaphysical here. Of course science offers methods to evaluate and refine their theories. Religion is largely hermeneutical. Whether we adopt an antirealist or realist position, the idea that we accept beliefs because they are true just isn't so. It isn't true of everyday reasoning (we accept what we observe given the regularity of our experiences and background knowledge). It isn't true of formal reasoning as present in the sciences, on either interpretation. The scientific realist is committed to the idea that their methods and values they weigh in their modeling will somehow converge on truth, will "divide nature at the joints," but what you suggest is to put the cart before the horse. This is far from an anti-realist critique. Popper, Lakatos and Kuhn all recognized it. There is a wealth of views on values in science that contend that view, such as perspectival objectivity (which I found out last night that Giere has written much on). Laudan ("Beyond Positivism and Relativism") also contends with the idea of "truth first" as you appear to argue. Furthermore, we can take the structuralist issues involving the pessimistic metainduction and the responses of people like Worrall, Ladyman and all the rest in that field of study (to which van Fraassen belongs). Whether we adopt an antirealist or realist position, the idea that we accept beliefs because they are true just isn't so. It isn't true of everyday reasoning (we accept what we observe given the regularity of our experiences and background knowledge). It isn't true of formal reasoning as present in the sciences, on either interpretation. The scientific realist is committed to the idea that their methods and values they weigh in their modeling will somehow converge on truth, will "divide nature at the joints," but what you suggest is to put the cart before the horse. This is far from an anti-realist critique. Popper, Lakatos and Kuhn all recognized it. There is a wealth of views on values in science that contend that view, such as perspectival objectivity (which I found out last night that Giere has written much on). Laudan ("Beyond Positivism and Relativism") also contends with the idea of "truth first" as you appear to argue. Furthermore, we can take the structuralist issues involving the pessimistic metainduction and the responses of people like Worrall, Ladyman and all the rest in that field of study (to which van Fraassen belongs). The point I was trying to make was not that antirealism can be weighed in, but that even the realist in contrast to the antirealist is not committed to this idea of truth as the primary measure of epistemic merit. I do not deny that belief in P may also compel the person to say "P is true." Here I think the van Fraassen's antirealist response is appropriate. We perceive our models to be true representations to speak of them meaningfully, but that in no way requires a commitment to their actually being real or true. All we require is empirical adequacy. Even the realist responses to which I alluded accept this on some level, but their arguments for truth in science go beyond mere theory acceptance. They argue for things like truth in convergence, theory progression or maturation of research programs. Truth is achieved at a higher level, and the same can be said about beliefs. We don't accept beliefs to be true, but we want our web of beliefs to be true in some sense. One can hold false beliefs and still have a coherent body of knowledge. Oh, but a final rejoinder: I don't think our metaphysical (realist vs antirealist) commitments matter. In fact, I think faith can find a better home in an antirealist position because there is more real estate for false beliefs that can be instrumental for accurate observations (a position others have, and I could, argue that the social sciences maintained for a long time, and somewhat even now). Where faith goes down in flames is entirely within methodological concerns. Science is meritorious precisely for this reason. Faith is methodologically impotent. Thanks again Bryan for all the thoughtful input. I confess there are too many puzzling claims in your comments that I don't even understand well enough to respond to. My view is that there are a number of serious problems with attempts to defend believing that God exists with appeals to faith. The view is obviously widespread, or perhaps it is only the hundreds of people that I lecture and correspond with that hold it. One thing you seem to be suggesting is that there aren't very many people who hold the view and you point to a PEW study about American's attitudes towards the literal truth of the Bible as evidence. I am at a total loss to see how various attitudes about the Bible shows that it is not a widespread view that there is one God that exists. There are over 100 million people in this country identifying themselves as evangelical and who subscribe to the view that the Christian God is real. A great many of them appeal to faith to vindicate this belief. I've argued, not unreasonably, that they are mistaken. Your view seems to be that those believers and I do not understand some sophisticated notions of justification, truth, and theory that are part of the modern debate about realism and anti-realism in phil. of science. You're right at least that I don't understand the position you're defending. And I still don't see how those points vindicate faith at all. 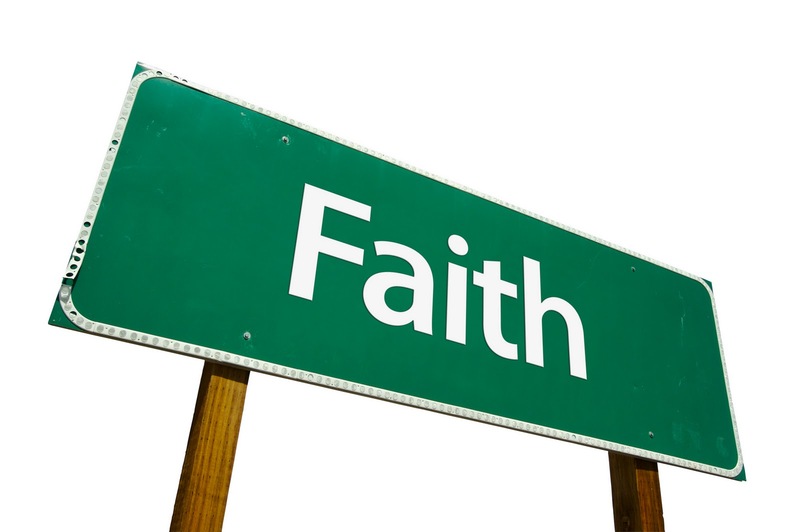 Is faith or is it not an epistemically culpable ground for believing that God is real? "I don't doubt there is a large number of people that subscribe to the sort of beliefs to which your criticisms can be weighed, but that is like saying "here's a criticism, now let's see to whom it applies." You speak broadly of all the faithful, but that group is far from homogeneous. One way to consider this more "realist" interpretation of faith, I suggested the Pew Forum report:"
Wow, evidently I have a lot of reading to do. I wanted to respond to this claim about the non-homogeneity of religious faith. I have to propose that the apparent non-homogeneity of the religious in the statistics is not due to a wide variety of concepts of faith, but due to how the single, meaningless concept utterly breaks down under the slightest scrutiny/questioning. The only other point I wanted to bring up is, it seems like Bryan is trying to change the game a little bit. I have to admit to being not completely familiar with what he is proposing, but it seems to want to, at some level, change the claims that religious people are making. While that seems perfectly reasonable in discussing concepts of realism/anti-realism, it seems arrogant to project any concept/meaning other than what is stated by them. The structure of Dr. McCormicks's argument is directly responding to the most common religious claims on faith. There are (obviously) many discussions to be had between philosophers on the concepts presented (I am not one), but there is something fundamentally arrogant I think with projecting a different, or perhaps, more philosophically sophisticated concept onto what a believer will say. Again, I have lots of homework to do on the subject, but I look forward to diving headfirst into some realism/anti-realism material. Thank you, by the way, for posting the authors in your posts. It's appreciated! The point of bringing up that page of the report was because the reliance on the scripture being the word of God (and therefore evidence), is that the majority of faithful do not rely on that sort of interpretation. We can also look at page 4. These results state specifically that people are not dogmatic about their faith: they are not exclusivists. If they are not exclusivists, then they accept their beliefs without conflict to alternatives. But how can someone believe that P while also accepting that it could be the case that P is false? This isn't the same as "well, we're just waiting for more evidence to confirm or disconfirm my belief" for, say, some inductive uncertainty. This is the same position even the scientific realist accepts. I used the example of the pessimistic metainduction. If we take our best theories to be true about the world (e.g., Fresnal's mechanical theory of light), and it is later rejected as being untrue when accepting the "now true" theory (e.g., Maxwell's electromagnetic theory of light), should we take it that scientific theories are epistemically culpable? We believe/accept scientific theories knowing they can very well be unrealistic and that someone can just as well accept a theory, contrary to ours, without any conflict. It only becomes a problem if we think our theories are committed to being true. So you ask, is faith an epistemically culpable ground for believing that God is real? Sure. But that is because you're insisting that the religious are faithful for that end. If we view science as aiming for truth, then science is on epistemically culpable grounds for believing that the content of their theories is true. Science does not aim for truth, and neither does religious belief. The faithful believe that God is real. This much is true. But faith does not and is not vindicated as the measure of the truth of God's reality. If it were, then we would expect to see much more dogma than the evidence displays. Do you not agree? You argued as much in your presentation! This issue is ultimately epistemic. You claim "the grounds for recommending belief are that it is true." I disagree, and by loosening this requirement, your criticisms fall apart. I am not making any positive claims apologizing for faith, so your question to me was pointless. I am, as I said from the start, only critiquing your argument. The point of bringing up that page of the report was because the reliance on the scripture being the word of God (and therefore can be used as evidence), is that the majority of faithful do not rely on that sort of interpretation. We can also look at page 4. These results state specifically that people are not dogmatic about their faith: they are not exclusivists. If they are not exclusivists, then they are accepting their belief without conflict to others accepting alternatives. This is the same position even the scientific realists accepts. I used the example of the pessimistic metainduction. If we take our best theories to be true about the world (e.g., Fresnal's mechanical theory of light), and it is later rejected as being untrue when accepting the "now true" theory (e.g., Maxwell's electromagnetic theory of light), then should we take it that scientific theories are epistemically culpable? We believe/accept scientific theories knowing they can very well be unrealistic and that someone can just as well accept a theory, contrary to ours, without any conflict. It only becomes a problem if we think theory acceptance commits us to the theory being true. So you ask, is faith an epistemically culpable ground for believing that God is real? Sure. But that is because you're insisting that the religious are faithful for that end. If we view science as aiming for truth, then science is anepistemically culpable grounds for believing that the content of their theories is true. Science does not aim for truth, and neither does religious belief. This analogy is to demonstrate the absurdity. This issue is ultimately epistemic. You claim "the grounds for recommending belief are that it is true." I disagree, and by loosening this requirement, your criticisms fall apart. I am not making any positive claims apologizing for faith; so your question to me was pointless. I am, as I said from the start, only critiquing your argument. If you were thanking me for the references I made, I should forewarn that you may want more detail. I have a Zotero library full of references from the past few years of research. If you desire, I can email you more specific references to the realists-antirealist debates. As for my criticism, I am not attempting to respond for the believer at all. The believer claims that they accept a religious belief on faith. McCormick is correct that faith is justification-less. The point is that he is wrong in claiming belief acceptance requires truth-acceptance. We generally think of rational acceptance to be justified by some truth-preserving argument, like in logic. A set of premises P logically (or statistically) entail some conclusion Q. Our acceptance of P guarantees a rational acceptance of Q. But to apply this mode of rationality to anything empirical utterly fails, and this was borne out when positivism went out of style over the past century. It would belabor the point to talk about all the alternatives and details of moving beyond positivism. Nowadays the very idea of objectivity comes into question. What is important to notice is that belief acceptance in no way commits us to truth preservation (and I'm staying away from the discussion of what truth even is!). 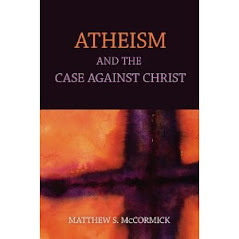 McCormick's argument, however, states clearly that belief acceptance is truth-preserving. It is the basis for his criticisms toward the end of his presentation. Otherwise, the fact that there are thousands of possible "God hypotheses" floating around would be a nonissue. But the argument is that it is an issue, because without justification, without truth preservation, the idea that faith determines belief is culpable. To be apologetic for faith for a moment, I would simply say that faith is scarcely used alone. Faith alone is an epistemically culpable position. Religious people have reasons for their beliefs, but they do not have truth-preserving reasons, and therefore with lack of evidence they rely on faithful acceptance like one accepts a moral imperative for no other objective reason. Sorry about the long delay in getting several of your comments published, Bryan. They were sitting in a "To Be Approved" file while I didn't realize it. You have, inadvertently, given me the empirical evidence I have been looking for to support my new proof for the existence of God: the argument from douche. P1: if a maximally douchy entity exists, there must some transendant, countervailing entity which embodies all that which in not douchy. Otherwise, douchiness would have overwhelmed the universe. P2: non-douchy things exist, such as Jesus, America, freedom, baseball, Ronald Reagan, etc. P3: a maximally douchy entity exists (proven by your last comment ). P4: maximal douchiness does not dominate the universe based on the existence of P2 + sunsets, babies, Chuck Norris, etc. P5: the transendant embodiment of maximal non-douchiness, which allows for existence of P2, must be spacess, timeless, immaterial, omnipotent, in order to overcome the maximal douchiness of P3. That entity is what classical theists call God. Thanks again neck beard boy. In all your pseudo-intellectual, teenage angst ridden butthurt fury, you have proven the existence of God!